An Ember in the Ashes completely hooked me with that synopsis. After hearing about a book set in a Rome-like world, I had my eyes set on it and I waited eagerly for its release. I’m happy to say that An Ember in the Ashes didn’t disappoint. My favourite thing about the book was the world building. I’m a giant sucker for anything related to ancient history, and Ancient Rome is one of my favourite things ever. An Ember in the Ashes didn’t disappoint in terms of the fantasy world in which it is set. There are Martials, an Emperor, terrible laws, a segregated society… everything I wanted. The only thing I could have wished for is more. More of everything, please. The pacing was also fantastic. An Ember in the Ashes is one of those books that you don’t realise you’re flying through until you reach the end. You could pick this one up anywhere and get hooked into the story straight away. It was such a thrilling read and I couldn’t put it down for long. The characters weren’t, in my opinion, particularly stand-out, although they were good enough. 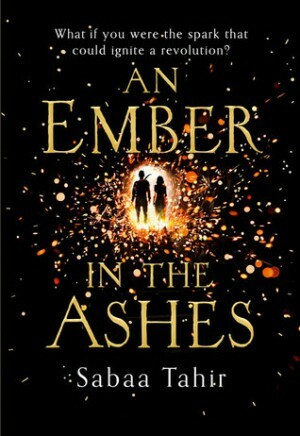 An Ember in the Ashes is told from two points of view: Laia’s and Elias’. Laia is a girl whose brother has been taken by Martials, and in order to get him back she has to become a slave and spy on the Commandant. This is where she meets Elias, a young man who’s training to become a Mask – one of the elite. What Laia has to go through during this book is sad and, at times, horrific. I felt so sorry for her, but I loved that she kept a strong mind and stuck to what she needed to do. As for Elias, I connected with him a lot less than I did with Laia. He’s not exactly a spoilt brat, but he’s a favourite at the Academy and this makes his life slightly easier. That said, he does have a complicated childhood and I feel a bit sorry for the guy. But overall he was just an okay character that I didn’t mind reading about, but I didn’t love either. I’m really looking forward to the recently announced sequel (you took your sweet time, Penguin) because I want to see more of this world and the powers that the characters are just discovering. Everything has changed after that ending, so I’m interested to see where this series goes next. While An Ember in the Ashes wasn’t quite the story of revolution that I was expecting, I’m hoping the series gets more intense and in-depth as it goes on. This sounds like a great book, like you I like authentic world building! Great review. I am so excited to read this one!